'The Urban Wildlife Gardener' is packed with planting ideas and simple gardening techniques to attract birds, bees, butterflies, beneficial bugs and more to your outside space. If you would like to attract wildlife to your garden, you need to learn which plants to grow, how to provide nesting areas, when to prune shrubs or mow the grass and when to leave well alone, how to deal with weeds, how to create a pond for tadpoles and frogs and more. The choice of plants is important, including shrubs which provide berries as food for birds, tall plants to attract bees and dragonflies, trees with nesting areas for birds, flowers to provide pollen for bees, and night-scented plants to attract moths and bats. Follow the insect-friendly ways to keep weeds under control and to deter unwanted visitors such as slugs, and learn how to make organic plant feed. Discover how to turn a pile of logs into a home for ladybirds and other insects, how to plant a hedge to provide cover for small mammals, how to create a pond (no digging involved! ), and how to make simple birdhouses and feeders. 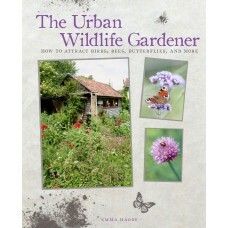 No matter what size your outside space — from a single windowbox to a full-sized garden — 'The Urban Wildlife Gardener' contains hundreds of easy-to-follow tips and techniques, simple projects, and essential plant know-how.